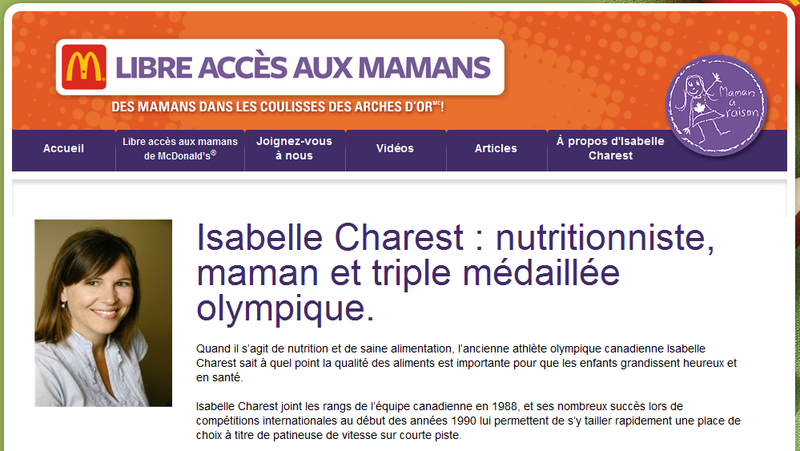 Isabelle Charest is a Canadian Olympian. As a short track speed skater, Isabelle medaled in the 1994, 1998 and 2002 Olympic Winter games, and following her retirement from skating, she went on to complete her dietetic degree at the University of Montreal. So what's she doing today? 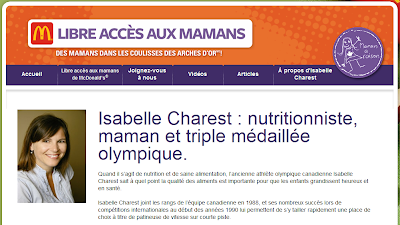 Today she's trying to convince "moms" that McDonald's is a healthy place to take their families as Isabelle is headlining McDonald's latest campaign, "All Access Moms". What's the program all about? "Parents across Canada want to know that they're providing quality food to their families. Now you have a chance to see for yourself the real quality behind McDonald’s® food with the McDonald’s All-Access Moms Program." In English speaking Canada, the program is being headlined by a celebrity nanny, Nanny Robina, but it's definitely French speaking McDonald's who have pulled off the marketing coup by landing not only a celebrity Olympian (aside from being named Canada's athlete of the year twice, Charest is currently part of a reality TV show highlighting elite athletes), but a mom, and an RD to boot! Now I'm not the only blogger to notice All Access Mom's. Annie, from PhD in Parenting saw it and she submitted her own video application to become an all access mom. Email subscribers, click through to the blog, it's worth a quick watch. "Boneless chicken breast meat, water, seasoning (salt, potassium chloride, trehalose, sugar, rice starch, hydrolyzed corn protein, flavour (autolyzed yeast extract, salt, disodium inosinate and disodium guanylate), spices, dextrose, garlic powder, autolyzed yeast extract, carrageenan, chicken fat, dehydrated cooked chicken powder, silicon dioxide, caramel, onion powder, corn maltodextrin), modified rice starch, sodium phosphates. Cooked on a grill lightly seasoned with trans fat free cooking spray (Canola oil, water, salt, hydrogenated cottonseed oil, soy lecithin, monoglycerides, potassium sorbate, artificial flavour and colour (annatto, turmeric), citric acid, vitamin A, vitamin D3)"